I'm creating a PS Query in 8.0 and I have a table that contains a field called "Effective Date" that shows the data in date format example "11/30/2010". If this field has multiple effective dates and I only want the most recent effective date pulled in the query, what critera do I enter? 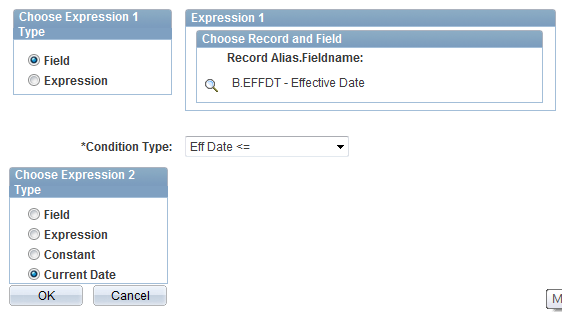 When you add the effective date field, the effective date criteria will automatically be added to your query to get the maximum effdt less than or equal to the current system date. The following is a screenshot of the criteria for the effective date field. To view this, go the criteria tab, then edit the criteria on your effdt field. Based on your PeopleSoft version, this will probably look different, but the same concept still applies. If you don't have this criteria, add the effdt field and add the criteria.